China and India are the oldest civilizations of Asia and the tortured history of the twentieth century unfortunately tore the two countries apart. Jawaharlal Nehru unfortunately mishandled the border issue in 1962 and provoked the India-China War which led to a comprehensive defeat for India. Since then there have been a few incidents in Ladakh and in the Arunachal Pradesh region, but there is little possibility of war between the two neighbours. It is to the credit of the new Government headed by Narendar Modi that saw an opportunity to improve Sino-India ties and he seized the chance and China also realized that peace with India is in her best interest. Unfortunately, China is still viewed with suspicion by large chunks of the population and this is partly due to the fact that little is known here about that country. President Xi Jinping arrived in India on 17th September, the birthday of the Prime Minister. Setting aside diplomatic protocol the President's plane landed in Ahmedabad where Narendar Modi personally welcomed the Head of State. The two seem to have hit it off well together and they enjoyed a cultural feast on the banks of the Sabarmati River. This morning the two delegations met in New Delhi for high level talks, even as the Media was reporting what it termed a large Chinese incursion. Since the border between the two Asia giants is not demarcated any movement along the border has the potential to disturb peace and tranquility along the LIne of Actual Control. India seems to have retreated a bit from the McMahon Line fixation that characterized the Nehru era and China too has shown great diplomatic wisdom in not allowing the border dispute to dictate the contours of Sino-Indian relations. Geographical features are now included as part of the elements that will help draw up the boundary between the two nations. Twelve agreements covering important areas of mutual interest were signed on this trip: Educational and Cultural exchanges were of course part of the boiler plate of such diplomatic exchanges. More interestingly, China has agreed to send 500 teachers who will teach Chinese in India. This will be a huge step toward normalizing relations with that country. In India there is hardly any expertise on Chinese language and whatever we read here is based on English language sources and the analysis is usually by American scholars who twist the whole narrative to suit the political needs of USA. It is time that the world realised that China has made huge progress in Science, technology and Education and India is willing to learn and benefit from the Chinese experience. China will invest 20 billion US dollars in Infrastructure projects over the next 5 years and this investment itself will add 2 % points to India's GDP. Narendar Modi has taken the right decision and I am sure that he will deliver. 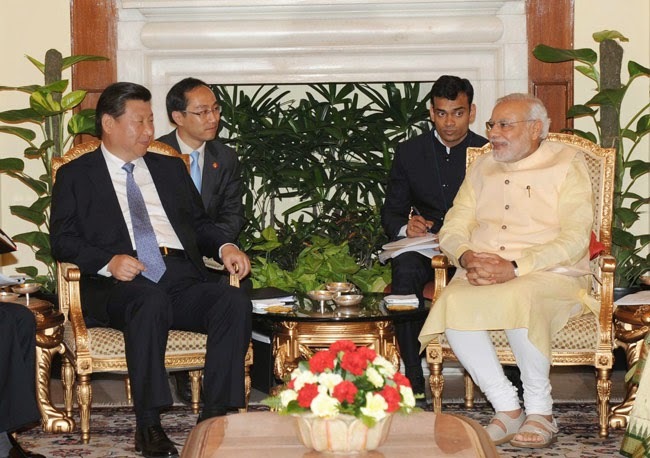 The visit of the Chinese Head of State marks a new beginning in India's relations with her biggest neighbour. Of course, the hangover of the jaded Nehruvian past is not fully dispelled. Bt a good beginning has been made.